For the past two decades, every President has proposed a fiscal budget that has underfunded immunization programming. Fortunately, over the years, Congress has been steadfast in approving higher amounts. As we approach another crossroad in our fiscal planning, we must, once again, call upon Congress to properly fund critical prevention programs. In the following Op Ed published in The Hill, Every Child By Two Executive Director, Amy Pisani, makes the case that Congress should support the CDC’s Immunization Program to the fullest extent possible. In order to truly effect change, the program requires $1.03 billion. While it may seem like a hefty sum, the argument in favor of full funding is that an investment in public health will save lives as well as future expense. By Amy Pisani, executive director of Every Child By Two, a nonprofit organization committed to reducing the burden of vaccine-preventable diseases in families and individuals. Earlier this month, President Trump released his proposed Fiscal Year 2019 budget. It notes an impressive achievement: For every $1 the Centers for Medicare and Medicaid Services (CMS) spends on preventing fraud and abuse, the agency saves $5. Whenever you can spend money to save money in government, it’s a no brainer for policymakers. Unfortunately, that rationale seems to have escaped the President on the issue of vaccination. For every $1 we spend on childhood vaccines, we save $10.10, which is nearly double the savings of preventing fraud. The vaccines given to children born over the past two decades will result in a savings of $360 billion in direct and nearly $1.65 trillion in societal costs. The benefits don’t end with children. The U.S. still spends nearly $26.5 billion annually treating adults over the age of 50 for just four diseases that could be prevented by vaccines: influenza, pertussis, pneumococcal disease and shingles. The majority of these avoidable costs are borne by federal health insurance programs. Yet for the second year in a row, the President has proposed gutting the Centers for Disease Control and Prevention’s (CDC’s) Immunization Program. This is not just a discussion of dollars saved. It’s also a matter of lives saved. Over the past 23 years the Vaccines for Children program has prevented 381 million illnesses, 855,000 early deaths and 25 million hospitalizations, but we have much more work to do. 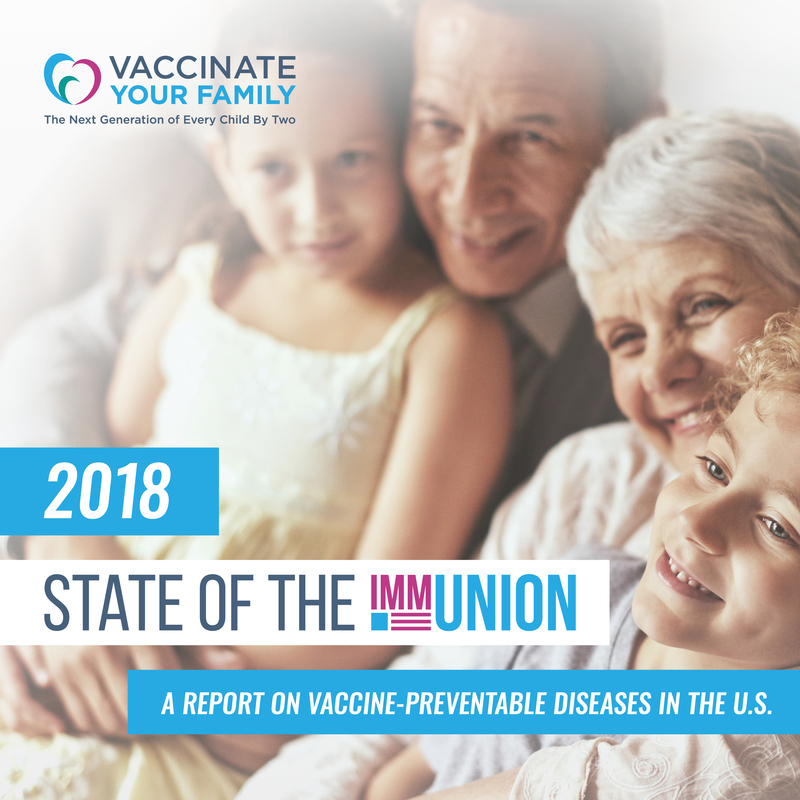 For information pertaining to the preparedness of our nation, and for suggestions on what we can do as a nation to make our country stronger and more resilient in the face of emerging health threats, review Vaccinate Your Family’s second annual State of the ImmUnion report here.